This winter, we asked “If you build it, will they come?” detailing our efforts to understand whether more restored habitat means more wildlife. This spring, we are happy to report that at least for several of our restoration sites, the answer is "Yes!" Restore the habitat and wildlife will indeed return. This spring we've seen animals respond to several of our large and small metro habitat restoration projects. A long-term 20-acre river bluff oak savanna undergoing restoration attracted red-headed woodpeckers, tadpoles wriggled in just-created wetland basins, and turtles were quick (relatively) to take advantage of newly built nest protection sites. In 1999, FMR, in partnership with Great River Greening and Flint Hills Resources, undertook the restoration of a roughly 20-acre oak savanna in the FHR-owned section of the Pine Bend Bluffs natural area in Inver Grove Heights. Choked by invasive shrubs like buckthorn, the oak savanna had essentially converted to a closed forest. Restoring its structure and composition to a native oak savanna has been an ongoing endeavor for nearly 20 years. One of the hopes for this restoration was that it would attract red-headed woodpeckers (Melanerpes erythrocephalus). Today, many people are only aware of this bird as a wooden cut-out that decorates many a lakeshore cabin. But forty or fifty years ago, these iconic woodpeckers were much more abundant in Minnesota. Habitat loss and other factors resulted in such significant declines, so much so that the Minnesota Department of Natural Resources has listed them as a species of greatest conservation need — just a step or two before "threatened" or "endangered" status. FMR ecologists are always looking for opportunities to create more habitat for red-headed woodpeckers, especially oak savanna. At long last, our efforts have paid off! 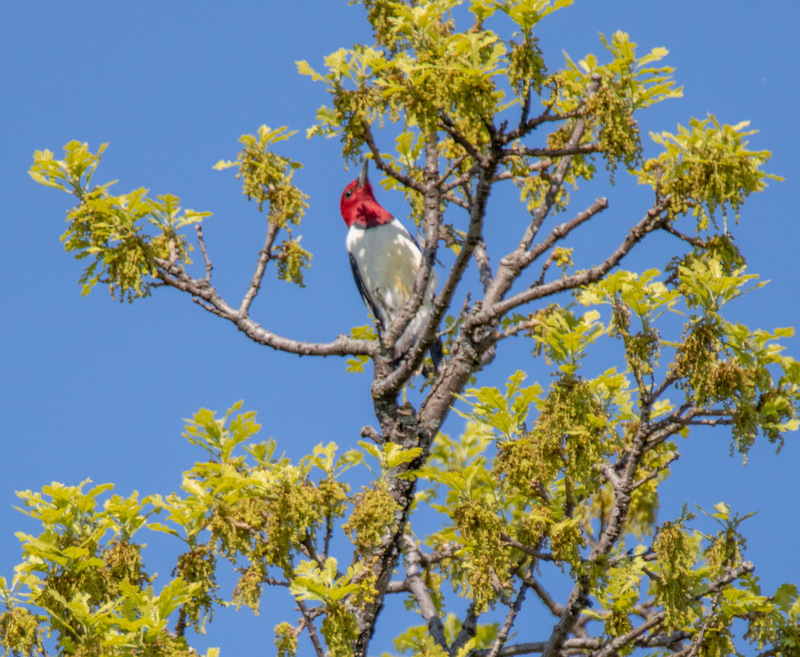 Two red-headed woodpeckers were spotted at this oak savanna this May. While this is not the first time we've spotted this species here, it is the first time we've seen two birds instead of one — a very encouraging sign. While we have yet to determine if the male and female stayed to breed, they have at least found habitat for future nesting years. As part of our restoration of the William H. Houlton Conservation Area in Elk River, we’ve taken more focused steps to provide habitat for specific types of species, in this case, herptiles (reptiles and amphibians). In our larger transformation of farm fields into a 180-acre prairie, we added two small wetland basins to add structural diversity and create habitat for frogs, turtles, and other creatures. With help and funding from the U.S. Fish and Wildlife Service, we dug out two basins that still held historical wetland soils below roughly 16 inches of agricultural soils that had filled in over the past 100 or so years. After removing the reed canary grass that dominated these spots, we seeded the basin with a diverse mix of sedges, rushes and wetland wildflowers, hoping to bring back diverse habitat to support a variety of wetland wildlife. Chorus frog tadpoles in the restored wetland at the William H. Houlton Conservation Area. This spring, in its first growing season, the plants are beginning to fill in and the wetlands are already full of wildlife. On our last visit in late May, chorus and leopard frogs abounded, a snapping turtle waded along the wetland edge, and the water was full of thousands of tadpoles. As the vegetation continues to establish, we hope these basins attract even more species. Finally, in one of our most focused wildlife projects to date, we’ve created a turtle nest protection enclosure at Spring Lake Islands Wildlife Management Area in Dakota County. With permission and help from Department of Natural Resources staff and funding from SeaLife Minnesota, we identified a spot where turtles were nesting in abundance, but where their nests were falling victim to a variety of predators. By creating a predator exclusion structure, we're able to allow the turtles to continue to access this preferred nesting site while greatly reducing the number of predators who can reach the nests. The Minnesota and Wisconsin DNRs have only recently started trying out variations of this method for protecting turtle nests, so the insights learned here will be important for this work going forward. A female snapping turtle digs a nest within our newly installed turtle nest protection project at Spring Lake Islands Wildlife Management Area. With our nest enclosure set up and activated by mid-May and our wildlife camera in place to capture all the action, we waited for turtle nesting season to begin. Luckily, we didn’t have to wait long! Within a week, we saw evidence of turtles digging in the sand at the site. In fact, five turtles nested in the enclosure before the end of May. After sorting out a few snags in our wildlife camera, we captured some of these turtles in action, including one large snapping turtle right in front of the camera (above). We also saw a curious raccoon investigating the trail cam, though it didn’t seem to investigate the electric fence surrounding the enclosure. This spring, we’ve felt both incredibly lucky and affirmed as we enjoy these wildlife habitat wins. They remind us why we work so hard to protect and restore habitat. While we know there’s much more to do, it’s nice to occasionally step back and see what we’ve accomplished. Hopefully, we’ll have many more positive things to report as the year rolls on. Stay tuned to Mississippi Messages (which also includes listings of volunteer events at these and other habitat restoration sites) or our facebook page for updates! For directions to these and other FMR restoration sites, check out our new conservation map!